SQL Runner is a small utility that lets you store and run SQL scripts against MySQL servers. It lets you build Script Sets that contain as many SQL scripts as you want. Each script consists of a test (for determining if the fix is required), a fix (for updating the SQL data), and notes that you can use to store any additional information. Script Sets are stored as XML files, and thus are quite easy to back up, share, and store in version control. 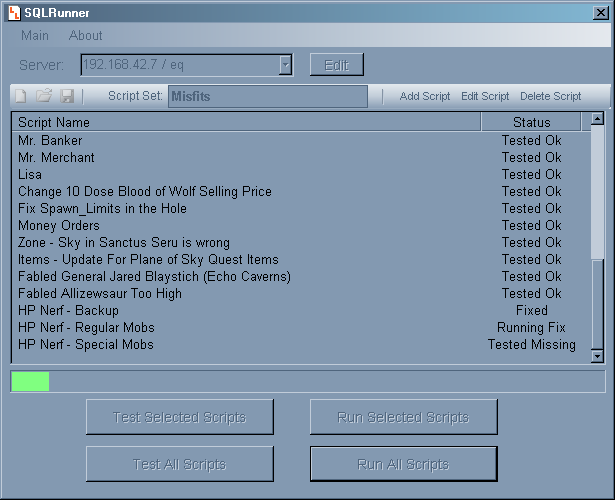 SQL Runner makes running multiple scripts against a MySQL server easier. ...... Script Sets are stored as XML files, and thus are quite easy to back up, share, and store in version controlled folders. * Support for MySQL servers -- tested against MySQL 4.x and 5.x servers. Execute everything, from programs, to text files, to multimedia. Space Runner - remake of the game Load Runner. PHPRunner creates set of PHP pages to access and modify any MySQL database. This game is all about speed. Parkour is the extremes urban sport. Qweas is providing links to SQL Runner 1.0 as a courtesy, and makes no representations regarding SQL Runner or any other applications or any information related thereto. Any questions, complaints or claims regarding this application SQL Runner 1.0 must be directed to the appropriate software vendor. You may click the publisher link of SQL Runner on the top of this page to get more details about the vendor.